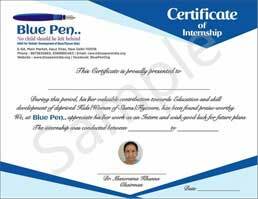 Blue Pen is the organisation working forward in providing education, vocational training, medical care and guidance over the health and safety measures to the people living far way from the basic needs of life i.e. — education, medical care and work. At Blue Pen you can support these people and kids living a life in doomed and extreme poverty by donating daily useful utilities such as soap, shampoo, oil, clothes as well as educational materials such as textbooks, notebooks, pen, pencil, eraser and sharpener etc.